Three out of three picked right for me, but only one went the way most anticipated. Part of the fun of this tournament comes from the confounding of expectations set before a single game has been played. Ireland came in being called the complete package, deep and disciplined, but they displayed a lack of attacking sharpness (zero line breaks) and gave away a foolish penalty that should have made Sexton’s heroic drop goal irrelevant. Scotland displayed naïveté and then a lack of resolve that poses serious questions about their ambitions and their on-field leadership. Sadly, France suggested they are not quite ready to shrug off the shackles they have been carrying for years now. Wales took all our sympathy and proceeded to play rugby that was expansive and a joy to watch. Some teams played their part. England played well enough to win comfortably against a game but out-classed Italy. The days following the opening weekend inevitably trigger simultaneous responses. One is to recalibrate expectations and the other is to overreach in drawing conclusions about form of both players and teams. I want to offer some points we can take away from the first round, but avoid making too much of any one thing. Rugby played well is a remarkably simple game, despite the myriad laws and seeming complexity of the action. The game is a series of physical confrontations that on occasion lead to open passages of play that succeed by moving the ball to players in space. Calm heads, stout hearts, discipline and precision in execution. Wales delivered the goods. Aggressive and accurate defense combined with terrific use of the ball in attack. Forwards and backs carried straight and offloaded deftly and accurately, opening up the field and frustrating Scotland into mental and physical errors. Viewers marveled at both props delivering perfect flick passes, unrated flankers dominating play, and young backs taking their chances. We even saw a Halfpennaissance, the veteran fullback playing as if it was 2013 again, scoring tries and kicking goals better than anyone alive. Even he was smiling at the end. The entire squad genuinely merits praise, something very rare. While much was made of the Scarlet hue of the squad, it also must be noted that necessity, wrought by injuries, conspired to bring this squad and style of play together in Cardiff. One hopes they play with the same elan and fortitude at Twickenham. Scotland, however, regressed as the game unfolded. Some early flourishes threatened the Welsh line, but inaccuracy and bad judgment foiled them. Two careless mistakes and they were 14-0 down. On second viewing, their first half performance was not as bad as the scoreline. Then they came out for the second half and canceled all of the positives from the past year. Very few players answered the call, Watson being one worthy of mention. Rather, standout players who should have led did just the opposite. Captain Jon Barclay antagonized the referee, who had an admirable game, with repeated offenses at the breakdown. Finn Russell started well and then orchestrated nothing with an incoherent backline. Stuart Hogg nearly vanished from the field. Many experts would have said the one thing to avoid would be kicking the ball to Hogg, but Wales did it early and often. Hogg passed it as often as he ran it back, as if he had forgotten himself that he was a world-class counterattacking threat. Without that, it made his defensive mistakes even less forgivable. He completely misplayed the break that led to Wales’ fourth try. Forward pass or no, Hogg had plenty of time and room to do better than cede the touchline while falling for a simple draw and pass move. Scotland welcome France, and will be desperate to regain their November form again. Their on-field leaders have to figure out how to lift the team. For his part, Townsend needs to get Huw Jones back to 13, and sort out which forwards will put their hands up to carry the ball forward. No need for desperation, but they need a reaction. In contrast to the first game, the less said the better. At least now, finally, the pitch in Paris held up in bad weather. I will say nothing about the HIA situation, which overshadowed unlucky injuries to two promising young players. Ireland dominated possession. They should have won comfortably. Instead, they conjured zero line breaks in a game in which France made 238 tackles. Keith Earls looked the most dangerous back with ball in hand. While they remain consensus picks for best halfback tandem in Europe, Murray and Sexton actually have to turn up and play well for Ireland to do well. Murray’s box-kicking game risks becoming stale as the game moves away from the aerial lottery of recent years, especially if he offers no threat to snipe around the fringes. While headlines rightly praise Sexton for saving Ireland at the death, his game up to that point was indifferent at best. Italy are coming to Dublin just in time for their Grand Slam campaign to regain momentum. Shame on Schmidt for persisting with Rob Kearney. Maybe nobody tackles Teddy Thomas in the open, but Kearney did everything wrong in that situation. So much for veteran nous. 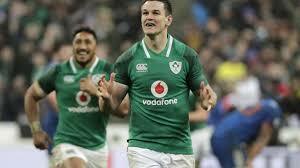 Let Larmour or Carberry loose in Dublin this weekend, as they have to play as much as they can before the World Cup. Let the past die. What to say about France? They selected a pack for mobility and played pachyderm rugby, simply bashing up along the fringes. Jalibert looked fine and made one clean break before being cruelly struck down. With Lamerat and the wings, they have the ability to do things in space. Maybe that is asking too much against Andy Farrell’s defense. It may be another year before clever coaches start to break it down. Yet, France refused to fold, registering an epic number of tackles and hanging in there until opportunity presented itself. Players like Gourdon and Camara belong in test rugby with their captain, Guirado. Vahaamahina, on the other hand, was the epitome of stupid indiscipline. Teddy Thomas had a quiet game, and then in a matter of seconds turned the game upside down. France travel to Murrayfield, both sides desperate for a better result. If the same defenses show up for both teams, France will find themselves comfortable winners. The final match of the weekend was going to have only one result: England winning comfortably after wearing down a game Italian side. Yet praise is due both teams. England were clinical from the beginning, if not dominant. Two very similar offensive moves led to two tries for Watson. By the World Cup, Watson should be the most feared back three player in Europe. His size, pace, and stepping are a rare combination. England seem to be both finding their starting backline while having an abundance of options, if injuries and circumstances warrant changes. Ford, Farrell, and Te’o offer a great mix to unlock the outside backs. With the depth England have, they have to sustain their sharpness through the tournament. Jones already is giving Joseph a shot, and he clearly is quite comfortable pressuring both centers to deliver their best. Given the presence of May, Nowell, Watson, and Daly, surely the time has come for a game, but limited Brown. The various combinations in the back three all seem more potent without him. Upfront, both Cole and Hartley responded in the best way, offering strong and direct running on top of set piece excellence. With the ridiculous depth at lock, Jones can limit his exposure in the back row, with Lawes and Itoje providing a combo platter to suit any need. Their presence changes the balance calculations in selecting open side and number eight. Itoje has jackal skills and is everywhere, lessening the need for a specialist open side. Robshaw is very good, but when Billy comes back into the side (assuming a recovery to his recent form), the question about open side will get very pointed. Simmonds is in his way as anomalous as Billy. He obviously would offer great versatility and danger off the bench, but his physicality and radical pace might warrant more. If England are healthy, selection may be their biggest challenge, save the All Blacks. England will feel confident, but Wales could offer a tantalizing prospect and possible game of the tournament a month early. Italy are moving forward with a bunch of new faces. O’Shea’s work is ongoing, however, and will take years not months to make a real difference. Many of the new faces rewarded his faith in selection. Not a moment too soon, as even the great Parisse is reaching his final chapter as a world-class player. The pack seems to be rebuilding all at once, which is daunting for the best sides. If Allan can build on this performance and solidify his spot, that would be a real step forward. He has the potential to be their fly-half for years, with Canna in reserve. More competition among the backs will accelerate their development, and the unity between clubs and country is encouraging. Italy may have a surprise in store this year, but no one should judge them harshly if they take the wooden spoon back home. What I want to see is continued faith in young players who must learn on the job. Despite a perfect tally for round one, I am mindful of some good fortune. While I correctly felt Scotland were still a frail side and they would stumble in the face of a good Welsh performance, Sexton well and truly bailed out me and many other prognosticators. The upcoming matches originally seemed a more difficult slate on the surface. While Ireland should easily cruise past Italy at home and under some pressure to perform, I am even less certain of the other two matches than I was before. Wales have the ability to disrupt England and have won two of the last four at Twickenham, but England still are rightful favorites. One hopes for a classic spectacle. For Scotland and France, one senses a desperate encounter. Scotland can be expected to offer significantly more resolve at home, but I remain unconvinced their defense can withstand the invasion.